Corporate Branding presents a challenge...companies need to convey a clear, concise imprint of what they do, and yet hopefully do so in a unique and memorable way. This hydro company found a brilliant way to extend its service to an elevated brand promise. 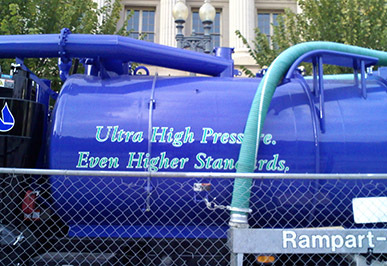 Their truck, emblazoned with the tagline "ultra high pressure, even higher standards" ironically appeared in the Pennsylvania Avenue plaza in front of the White House, ostensibly to do some high-pressure cleaning. This happened to coincide with the news of the moment, with Obama just signing a couple executive orders to address the ethical issues around lobbying and influence peddling when high-level execs leave their federal posts to cash in on their connections as lobbyists. Certainly the right place for some real and symbolic heavy duty power washing to clean up the gunk. 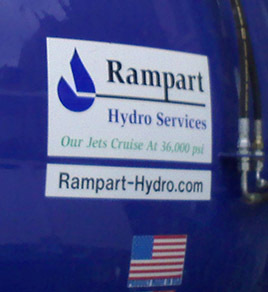 Oh, and on the back of the truck: “Our jets cruise at 16,000 psi”. Brilliant. Please send us your questions and we'll be back to you right away. Thanks! Copyright © 2019 DCPR. All Rights Reserved.